Its history and tradition date to antiquity. It's singular purpose is to make good men better. Its bonds of friendship, compassion, and brotherly love have survived even the most divisive political, military and religious conflicts through the centuries. Freemasonry is neither a forum nor a place for worship. Instead, it is a friend of all religions which are based on the belief in one God. Freemasons are respectable citizens who are taught to conform to the moral laws of society and to abide by the laws of the government under which they live. They are men of charity and good works. They remain unchallenged as the "world's greatest philanthropy". Only individuals believed to be of the finest character are favorably considered for membership. Every applicant must advocate his belief in the existence of a Supreme Being (atheists are not accepted into the Fraternity). One must ask a Masonic friend to recommend him for membership. He must sign a petition, stating his age, occupation and place of residence. Members of the Lodge vote by secret ballot. The candidate receives three Masonic Degrees, concluding with the Third (or Master Mason's) Degree. The Degrees are solemn, enlightening and an enjoyable experience with no uncomfortable or embarrassing moments. It is here where the principles of Freemasonry are taught and where the new member learns that his family and his own necessary vocations are to be considered above Freemasonry. Every Master Mason is welcomed as a "Brother" in any of the thousands of Regular Masonic Lodges throughout the world. Secret societies are generally defined as organizations which are unknown to the public and whose existence is denied. The Bavarian Illuminati and the Mafia would be examples of secret societies. Masonry, on the other hand, is well-known and proudly displays its existence. 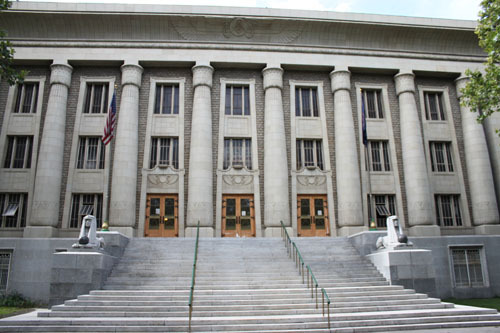 Masonic Temples are clearly marked as such, and many Lodges are listed in the phone book (usually under "Fraternal Orders"). Members often wear rings or tie-clips that identify themselves as Masons, and Masons often participate in community charity work. Finally, some Masonic functions are open to the public. Masonry is not a secret society, but rather a society with a few secrets. These are mainly modes of recognition - the signals, grips, signs, and phrases by which Masons recognize each other. The actual degree rituals are considered secret as well, not because there is anything that would harm Masonry by their revelation, but rather because they are more meaningful if the candidate does not know what is going to go on during them beforehand. It should be pointed out that many other organizations have a similar class of secrets. College fraternities (a.k.a. "Greek letter organizations") often have small secrets known only to their members, allowing them to travel from house to house and still be known. Is Masonry is a religion? "Masonry is not a religion by the definitions most people use. Religion, as the term is commonly used, implies several things: a plan for salvation or path by which one reaches the after-life; a theology which attempts to describe the nature of God; and the description of ways or practices by which a man or woman may seek to communicate with God. Masonry does none of those things. We offer no plan of salvation. With the exception of saying that He is a loving Father who desires only good for His children, we make no effort to describe the nature of God. And while we open and close our meetings with prayer, and we teach that no man should ever begin any important undertaking without first seeking the guidance of God, we never tell a man how he should pray or for what he should pray. Instead, we tell him that he must find the answers to these great questions in his own faith, in his church or synagogue or other house of worship. We urge men not to neglect their spiritual development and to be faithful in the practice of their religion. "Freemasonry has no dogma or theology. It teaches that it is important for every man to have a religion of his choice and to be faithful to it. A good Mason is made even more faithful to the tenets of his faith by membership." Rev. Norman Vincent Peale, who was also a Mason. Who is the head of all the Masons? Each Grand Lodge has its own jurisdiction and is the supreme authority within that jurisdiction. Obviously, many Grand Lodges have regular communication with each other, but official policy in one has no effect in another. Like all organizations, Lodges must be able to pay their light bills. There is a one-time fee for the three degrees of Masonry, as well as regular annual dues. These vary widely depending on the number of members, the actual physical facilities of the Lodge, etc. The fees and dues, however, are not prohibitively expensive. What is a Masonic Funeral? Any member who was in good standing at the time of his death is entitled to a Masonic funeral if he or his family requests it. Such a request should be made to the Master of his Lodge who will make the necessary arrangements with the family, the mortuary, and the minister. A service is authorized by the jurisdiction in which you are located, and consists of participation at the mortuary, the beginning at the mortuary and the closing at the graveside, or graveside only. Pallbearers will be furnished at the request of the family. In general, the Lodge will do as much or as little as the nearest relative wishes it to do. Isn't Masonry just a place where businessmen make deals? In fact, most Masons believe that to trade with a Brother Mason only because he is a Mason is unmasonic. Even more importantly, anyone who attempts to join a Lodge solely for business reasons will not be given a petition. But Masonry is not a "place to network". Yes, some men do view one of the benefits of membership as an additional source of customers or partners, but few would say that is the only reason they became Masons. The work involved in the degrees alone would make this a poor investment - better to join the Rotary Club or other business group. Are Masonic rituals are demeaning or embarrassing to the candidate? Nothing could be further from the truth. The rituals (degrees) are designed to reinforce virtues that the Craft finds desirable, such as Justice, Brotherly Love, Truth, and the like. The rituals are actually quite beautiful and filled with ancient language and much symbolism. At no point, however, is the candidate asked to do anything that would embarrass or demean him, nor anything that would violate his obligations to his faith, country, or the law. Can you be a Mason no matter your religion? The only religious requirement is that candidates believe in the Supreme Being. If you can in good faith profess a belief in the Supreme Being, you are eligible to be a Mason. No atheists will ever knowingly be made a Mason. There are Christian (Catholic, Protestant, Mormon), Jewish, and Muslim Masons. It would be tedious and pointless to go into a religion-by-religion (and then denomination-by-denomination) discussion. The key points to remember are the requirement of belief in the Supreme Being and the fact that Masonry is a fraternity, not a religion. Do I have to be invited to become a Mason? Don't wait to be invited. 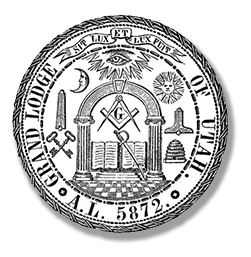 Historically Masons were prohibited from actively recruiting or asking non-Masons to join the fraternity, to insure that candidates come of their own free will. Still, you don't need to be invited, if you're interested, act. I am interested, but how do I proceed? One of our Mottos is 2B1Ask1. If you already know a Mason, ask him about membership. He will be glad to tell you all about the Craft and the local lodge, and give you a petition if you wish to join. The applicant fills out a petition. The petition asks for two sponsors, one of which has to have known the applicant for 6 months. If you do not kow anyone in the lodge you can meet and talk with the officers, they can usually find sponsors or act as sponsors themselves. The petition is read at the lodge during the next business meeting, which for many lodges is during the first week of the month. A committee is formed to investigate the candidate. The petition also asks for two character references. Have additional questions? Please ask us.